Volunteers use the evaporator to boil sap into syrup. DARKE COUNTY – The sap is flowing and the fire is roaring in the sugar shack; that means it’s time to enjoy nature’s sweet treat. Beginning at 8 a.m. March 2 is Maple Sugarin’ at the Prairie. The Friends of the Parks once again will serve up a hearty breakfast of waffles, sausage, juice, coffee and of course pure Ohio maple syrup. Breakfast will be from 8 a.m.-noon March 2, and carryout is available. Tickets are available at the door on the day of the breakfast for $6 for adults and $3 for kids ages 3-12 or pre-sale is available at the Nature Center from 9 a.m.-5 p.m. Monday through Saturday. This festival at Shawnee Prairie Preserve offers guided tours through history and science to learn the process of turning sap into syrup. After the tour through the woods, guests can visit the sugar shack and warm up in the steam-filled evaporator room as the sap spends numerous hours on a boil to reduce it down to syrup. 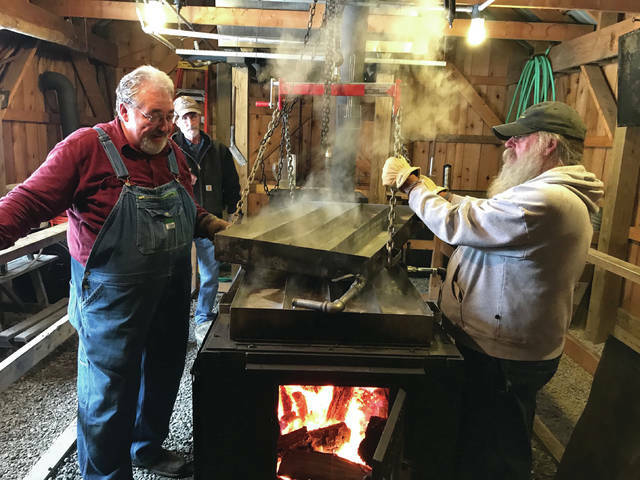 Then guests can head out to the log house and blacksmith shop to visit with the pioneers from 200 years ago and learn historical maple sugar uses. Finally, guests can complete the day at the Nature Center where the gift shop and bake sale will be full of maple goodies for anyone’s sweet tooth. Anyone who has any questions about this or any other program offered by the Darke County Parks may call the Nature Center at 937-548-0165 or visit the website at www.darkecountyparks.org.